Initial unboxing of the Kozee reshelled TF10 – the workmanship is great as you can see from the pictures. The biggest issue is the plugs as the right plug sticks out slightly further than the left plug, but it really makes no difference when a cable is attached. The second two pictures are with the stock TF10 cable, which is in place for comparison with a universal TF10. My comparison notes are as follows so far: the reshell is SO MUCH MORE COMFORTABLE than the stock TF10! I wore the stock TF10 for a few hours today and my ears were hurting. Fit seems very good with the reshell and I don’t lose the seal when chewing or moving my mouth. Although I will need to wear them for a long period of time to make sure they have long term comfort. 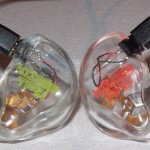 The reshell lacks the treble sparkle of the universal, along with much more forward mids. I tried to take matters into my own hands by pushing the filter back further, which did increase the treble, but I also pushed one of the middle parts of the filter out of the metal ring, requiring the shell to be redone. Back to Kozee. There back! My initial A/Bing tells me they are very close, so good to go! The filters look a little deeper than before, but not by all that much and I am going by the pictures/memory. And I wanted to say thank you Adam for working with me on this even though I cause more work as he redid the right shell. I did send the universal TF10 I have on loan for comparison, so I want to say thank you to the owner for your patience. ITthe filters in both sound tubes have been moved back. And yes, it seems the new graphics are orange instead of red. I used the stock cable on the universal and reshell, even though the reshell uses a Westone style connector. I used my modded iPods -> Pico Slim, HUD-MX1, and iPhone for sources. 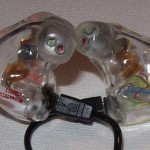 The tips used for the universal were UE bi-flange and MC triple flange. The bi-flange seemed to have slightly less offensive treble, but a slightly more recessed midrange in addition to lacking some deep bass impact compared. The triple flange tips seem to have a lower treble/upper mid bump that is somewhat offensive to my ears at louder volumes; I guess I can’t get it perfect with the universal version. Comfort for me reigns supreme with the reshell, and it isn’t even close. I just put the reshell in and everything is fine. With the universal TF10 I have to insert and then fiddle for a while, so it takes 3-4 times as long to insert the universal. Let me start with the treble. My biggest complaint of the first reshell I received was that the treble sparkle was gone, but the second one is pretty spot on! 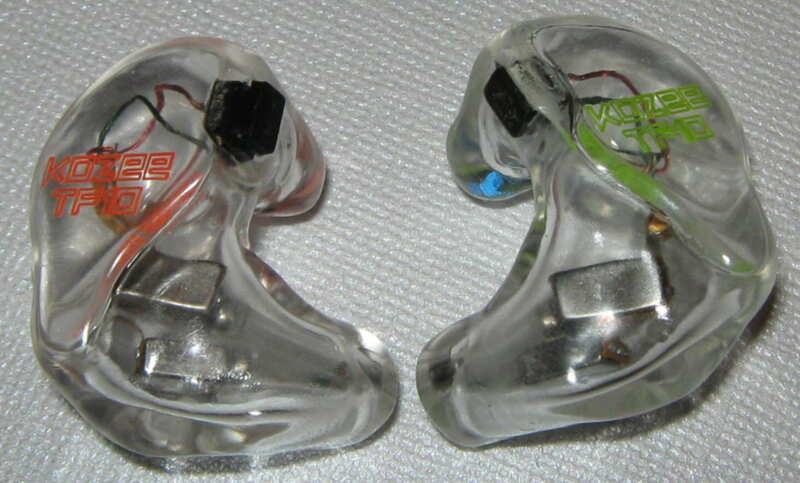 I wouldn’t expect them to be identical because there could be many subtle differences between how the universal and custom fit in my ear such as insertion depth, insertion angle, exit port size/shape, etc., but close as close can be IMO. It also might be slightly different from the perspective of the sound signature is slightly different as you will find out if you keep reading. Everything is pretty much the same, except I think the reshell is slightly less offensive to my ears at loud volumes due to the less pronunciation of S’s. Detail seems to be about the same. The mids of the reshell are a little more filled in than the universal for me, although not by much. The first reshell was much more mid forward, and I would say the mids on the second reshell are recessed, as are the universal, but to different degrees. Adam did get it right however, and for those that love the TF10 sound signature, I can’t imagine the difference being a bad thing. Since the mids are more forward by a bit, I can make out a little more mid detail, but not a significant change. Bass response of the second reshell is pretty similar now, although the deep bass is more prominent than on the universal. The first reshell seemed to have a good deal more warmth/deep bass compared with the universal (and 2nd reshell). When there isn’t deep bass the universal can seem to have more bass because of the more recessed mids. Of course, I prefer deep bass to mid-bass (although the mid bass is still there) and the custom’s slight advantage is nice. The TF10 is touted as having a spacious presentation, however all of my current IEMs (SM3 and customs) have more space than the universal TF10. The reshell does push the space out further side to side. For example, comparing the TF10s to the SM3, the SM3 was more spacious than the universal TF10, but less spacious than the reshelled TF10. The reshelled TF10 keeps the soundstage shape and doesn’t add much detail/separation to the presentation, although there is some. Overall the changes between the second reshell and the universal are minimal in sound, but the changes that are there all seem to favor the reshell. Just a thought for those that like the TF10 for the most part, but want more mids/bass it might be possible for Adam to tune the treble like the second reshell and the mids/bass like the first reshell. What difference does the $35 Kozee cable make? First, the cable is much more ergonomic and tangle free. My comparison methods consisted of both comparing the universal TF10 with the custom TF10 with the Kozee cable and swapping the cable. One thing that seemed to stand out the most was the treble seemed to have slightly better detail and there was better clarity/a little less thickness along with a little bit more openness. These differences are subtle but IMO you might as well go for the Kozee cable. I compared the reshelled TF10 vs. SM3 with universal tips (triple flange) and wow, what a shock going from one to the other. The TF10 is V shaped and the SM3 has laid back treble with forward mids, leading to a big difference. So, without talking more about the sound signature differences, how do they compare from a technical perspective? To me, with acoustic there is no contest that the SM3 presents the music in a more realistic way as the TF10 soundstage is compressed front to back in comparison (and top to bottom) while the TF10 sounds more distant. Yes – It Can Happen is a good example of this. Transparency, coherency and imaging are better on the SM3, especially with R&B. The bass of the SM3 edges the TF10 in note sustainment for R&B by a bit. In the midrange I found that in Nelly Frutado – All Good Things I did not hear a subtle midrange sound in the beginning of the song with the TF10 when I switched to the SM3, and switching back confirmed this. The treble of the TF10 is a tough one for me as certain parts of the TF10 treble sound as smooth and liquid as the SM3, but then other times the S’s are too pronounced and the tone sounds a little off. I also compared the universal TF10 with the Kozee X3 which is much higher in price ($630 vs. $250), so they aren’t competitors, but they do have somewhat similar sound signatures. The X3 is much more exciting and dynamic than the custom TF10, with better bass impact, a more forward midrange, more treble energy, better space, and overall more detail. When comparing the two I did want to take the TF10 out and put the X3 in! The reshell has a decided advantage over the universal TF10 in comfort, isolation, and cable ergonomics (with the Kozee cable). From a sound perspective, the reshell has minimal improvements in deep bass, mids, and soundstage. The Kozee cable arguably improves upon the sound, but also adds to the ease of use. The technical improvements are small with the custom and for me the comfort and isolation are two great reasons to do the reshell. But there are sonic improvements. What should you expect from a Kozee reshelled universal? Very good workmanship at a reasonable price that is at least as comfortable as the universal but with better isolation in most cases. From a sound perspective, depending on the final tuning, you will probably have a slightly more spacious sound and better deep bass impact. You can choose silicone or acrylic, and silicone will give more isolation and great comfort while acrylic will allow you to have a detachable cable.